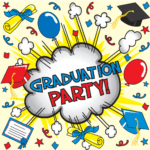 Class of 2019 members – your grad party will be held at the Grace Baptist Church, 4197 State Street SE, Salem. Party time is 10:00 p.m. to 5:00 a.m. Tickets for this fun event go on sale the week of April 15th. The cost per senior is $5 and includes a free T-shirt.